I’ve cooked pork before in the slow cooker, but not pork belly mainly shoulder, so this was a first. I love my slow cooker – it’s great for soups and stews plus it needs very little attention. From our experience make sure if you’re using onions in your recipe to first cook them on the hob then add to the pot otherwise they don’t stew down well but become really strong and overwhelm the dish. Cooking pork in the slow cooker is so simple and easy – it’s a bit embarrassing to write about it really but I want to encourage you to pull that old box out from the lower cupboard, dust it off and find a place on your work surface for your slow cooker. This shouldn’t be a neglected gadget, it’s a really useful and time-saving device in a hectic London life. Instead of cooking stuff in the oven or on the hob this extra piece of frugal kitchen kit keeps a dish ticking over nicely, you can moderate the temp from low to high and leave it in peace for hours. My soup for the Supperclub goes into the pot early on a Saturday morning on medium for 4/5 hours then later it is set to simmer on low until ready to serve, easy! So – a simple pulled pork belly supper. Pour the olive oil onto the bottom of the pot then add the pork with the skin side downward. Add all the herbs, pour over the elderflower cordial and cover with the lid! Cook on high for 3 hours then baste the meat with the juices and reduce the heat to medium for another 6 hours. The beauty is that it doesn’t dry up, it becomes softer over time and finally the pulled pork meat collapses under your knife. 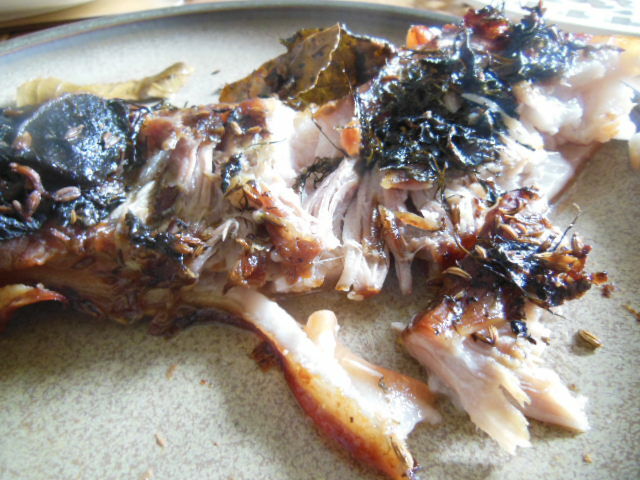 I love cooking pork this way in my slow cooker as it is so easy and no fuss – the day continues without having to cook, watch, stir etc – this is working from home food, decorating the house food, gardening food, busy day food – you get the idea! 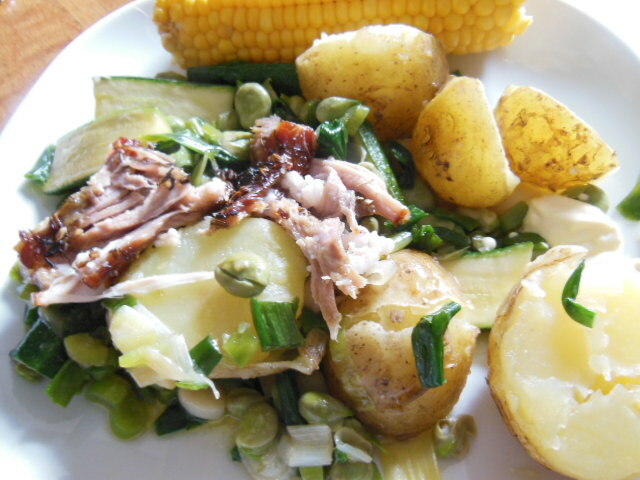 We bought our pork from Woodhouse farm stall at the Sunday farmers market in Walthamstow, I served it with this week’s organic veggies from Organiclea (community allotment in Chingford). It is an amazing time of year for broad beans, baby courgettes, spring onions and wild garlic plus fantastic new crop Jersey Royals and tasty salad leaves. Now off to wash the local strawberries for dessert – having a lovely day! This entry was posted in Markets, Recipes and tagged easy, farmers market, london farmers market, OrganicLea, Pork, Pork belly, quick and easy cooking, simple, Slow cooker, Walthamstow, walthamstow farmersmarket, Woodhouse Farm. Bookmark the permalink. Hello – this sounds like a fab and easy recipe. Is there any issue with the fat from the pork belly in the cooker, or does it cook out/become part of a nice sauce? You’re a gem, thank you, I was wondering if using my slow cooker for this sort of thing would work, and it looks like it will. Yums incoming! I am going to give this a go as it sounds great. I am going to use a cider instead of the cordial. What about the lovely crackling? How does the skin come out when cooking skin side down? Delicious! I used honey as I don’t have cordial yet and considerably more sage.